HPWS caters for both commercial & domestic customers who require a professional & efficient power-cleaning service. Our extensive service also includes maintenance for both commercial and the domestic customer pressure washing needs. All areas are removed of any debris, leafs and large weeds prior to cleaning. If requested we can weed kill the area a number of days before cleaning to kill all weeds to give a longer lasting period of time without weed growth. The areas can also be chemically treated against Moss and Algae this is quoted for separately on request. HPWS - your way to a cleaner way of living! 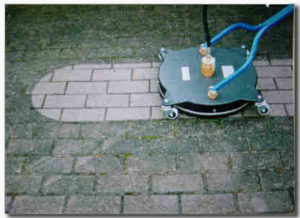 is to provide a professional, cost–effective & friendly cleaning service for driveways, patios, paths, low walls, etc, using the latest high–pressure jet washing equipment. Algae, moss, ground-in dirt, grease and oil are removed from block paving, concrete, tarmac, etc, to restore the surface to its near-original condition. A re-sanding service is also available for block paving.